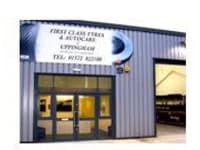 1st Class Tyres & Autocare Limited opened its doors to the public on the 12th of September 2005. After one year of planning and a considerable transformation of what was a very run down (Old Sorting Office), Russell Errington and his team have created a very locally focused tyre centre that accommodates perfectly the needs of residents and businesses in Lutterworth, Broughton Astley and all the surrounding villages in South Leicestershire. 2008 and 1st Class Tyres & Autocare are proud to announce the opening of their second centre on Station Road, Uppingham. The opening of their second centre shows the focus and commitment of Russell and his team. Russell , who in 2006 was a Finalist of the Welland Enterprise, 'Most Promising Start Up Business Award', has used all the knowledge that he has picked up since starting in the industry 24 years ago, to ensure that everything focuses on the most important target, the needs of the customer. Lutterworth centre is located on Misterton Way, right by Natwest & Barclays Bank. Whilst Uppingham centre is easily found on Station Road, both are just south of their respective town centres. 1st Class Tyres & Autocare prides itself on offering competitive rates on tyres as well as many other Autocare needs & requirements.